RIBBON AND EMBELLISHMENT SHARE FROM THE HOLIDAY CATALOGUE! **Join Both shares for $20. Let me know ASAP if you want to join in on any of the shares. **Additional postage to mail products out to you is not included. That will be a very small cost though. PAPER AND RIBBON SHARE TASTER! With a new catalogue there is always gorgeous new paper and ribbon, and this Occasions Catalogue is no exception. Just beautiful!! I have put together a little Taster of a Ribbon and Paper Share that you can join in with. It’s a great way to get some of that gorgeousness without buying a whole roll or a whole pack. Add the extra Night of Navy Corduroy Ribbon in Option B. If you want to take part in a share, drop me a comment or email me ASAP. Prices don’t include postage on to you. Australian Residents Only. Pick both Ribbon and Paper share and receive a bonus gift. 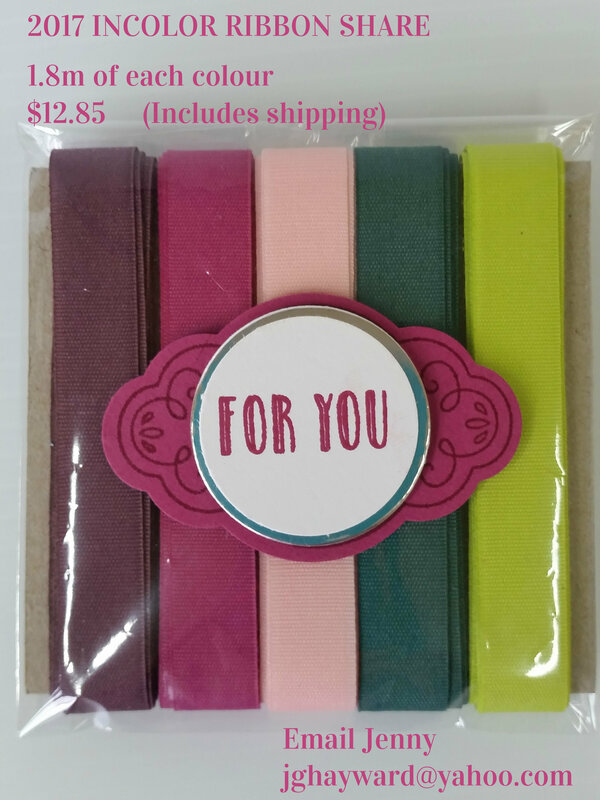 2016 OCCASIONS CATALOGUE RIBBON SHARE!! Who loves ribbon??? Especially when it is lush Stampin’ Up! ribbon that matches your card AND ink and just finishes it off with that elegant touch. I know sometimes it is hard to get through a whole roll of ribbon. So why not share it around! Join in my Ribbon Share and get a taste of all the different ribbons and twine in the Occasions Catalogue. Take your pick OR join them all. Here are the details. Just message or leave a comment that you want to take part and then I can get back to you about shipping etc. So you can join in as many of the ribbon shares as you like. Join them all and receive a discount. Total for all the shares is $11.50. These shares already include the 5% Shipping and Handling. If you need the ribbon shipped to you there will be an additional small cost to send them on to you. RIBBON SHARE FROM THE HOLIDAY CATALOGUE!! Have you seen the gorgeous ribbons and trims in the Holiday Catalogue?? So lush! 🙂 I know it is hard to get through a whole roll of one type so I have put together a Ribbon Share for you to have a little taster. Check the details below. This is for Australian Residents only. (sorry folks!). Let me know if you want to join in and we can fix up the details. You can join in one lot or more. You can take more than one share yourself. It works out quite cheaply. Do you like???? Let me know ASAP if you want to join any of the shares. cards, Product Share, Stampin' Up! 2015 STAMPIN’ UP! CATALOGUE PRODUCT SHARES! Do you like some of that lovely ribbon in that catalogue?? Of course, it is so lush. But I know it can be hard to get through a whole roll of that ribbon. So I have put together a Product Share so you can enjoy a taster. Here are the details. Message/comment to take part. This is for only Australian residents. Dotted Lace Trim – This is such gorgeous soft lace. Metallic Thread – great for those little swirls to embellish your projects.